A disturbing report from The Washington Post regarding the lack of warning for the tragic wildfires in California. "Panic"? That is what we heard 60 years ago with regard to tornado warnings. The result, in part, of not warning of the wildfires? In Lake County, officials took a different course. No deaths have been reported in Lake County. 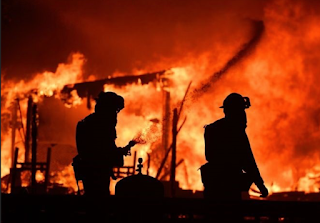 The death toll of 36, with dozens missing, is one of the worst fire fatality death tolls in decades. Warnings can be successfully issued for wildfires as Lake County demonstrated with this round of catastrophic fires. But, authorities outside of the areas where tornado and hurricane warnings are routinely issued, still seem to have a mid-20th Century when it comes to their reluctance to issue warnings of natural hazards. That needs to change. ADDITIONAL INFORMATION: This is from my friend, Lanny Dean, who was covering the wildfires in California. I don't care who wrote this story, it is NOT ACCURATE. At least not for Sonoma counties and north. I won't give an example, I'll state facts - I received notifications on my tablet/phone directly just as I would a tornado warning. Granted I received it only once, and that was not long after we moved into Sonoma county. But legitimate warning via text alert notification was transmitted and received. I suspect that this story doesn't have all the facts much like any media - it isn't giving all facts.